Excitement built in Johannesburg on Sunday with Dutch and Spanish fans roaming the streets ahead of a mouth-watering climax of Africa's first World Cup between the tournament's two most impressive teams. The best World Cup games often come in the semi-finals but Spain and the Netherlands are seen as the pick of the bunch here technically, tactically and temperamentally. Thousands of Dutch fans dressed in orange and Spaniards in red have competed to see who can sing the loudest and wear the silliest outfits, with South Africans joining the party, bursting with pride at hosting a successful tournament. Eight hours before the match, Dutch and Spanish fans kicked a ball in front of the cavernous Soccer City stadium. "Tomorrow there will be a celebration so loud in Amsterdam you will hear it in Madrid!" crowed businessman Arno van der Heijden, 41. Huge crowds will watch the match at open air venues in their home countries with up to 100,000 expected in central Amsterdam, which is bedecked in orange flags and banners. A worldwide television audience of more than 700 million is expected to watch, FIFA [ ] said. Sunday's final is a first for Spain and a third for the Dutch, who were runners up in 1974 and 1978. The final has raised spirits in two countries that badly needed cheering up. The Dutch went through polarising elections in June that failed to produce a clear winner and Spain is torn by bitter political infighting over how to address Europe's highest unemployment and crippling debt. The Spanish and the Dutch perfectly illustrate this World Cup's biggest lesson -- that the teams who play as units are superior to those that revolved around fallen pre-tournament favourites like Cristiano Ronaldo [ ] and Wayne Rooney [ ]. The successful tournament is also a triumph for South Africa [ ] which has confounded years of predictions that it would be a disaster marred by violent crime, chaos and unfinished stadiums. President Jacob Zuma [ ] thanked the nation, saying they were stars and champions for hosting a successful tournament and "opening up your country and your hearts to the world." Despite being the first host nation eliminated at the group stage, locals have remained enthusiastic spectators, helping this World Cup to be the third best attended ever, with 3 million seats sold, behind the United States in 1994 and Germany [ ] in 2006. Chief local organiser Danny Jordaan [ ] said the tournament had brought the races together and enabled South Africans to walk tall after being told for years they were inferior. "The nation has crossed a huge psychological barrier," he told reporters. 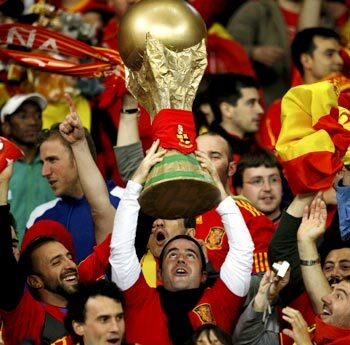 European champions Spain are the popular choice of many South Africans because of their stylish game, and easily topped an online international press poll. But the Netherlands will be tough to beat, with a powerful trio of Dirk Kuyt [ ], Wesley Sneijder [ ] and Arjen Robben [ ] to combat Xavi [ ] and Andres Iniesta [ ] leading Spain's masterful midfield. Spain have tormented opponents with their talent for holding the ball and precise passing even under pressure, but have lacked killer instinct in front of the net with only seven goals from six matches. The Dutch have been more prolific with 12 goals, but have also seemed to lack the killer instinct at crucial moments. Spain's fans will be led at the final by Queen Sofia while the Dutch are backed by outgoing Prime Minister Jan Peter Balkenende, among an array of VIPs. But the big question will be whether Nelson Mandela [ ], the beloved father of the post-apartheid nation, will attend. Mandela, 91, missed the opening ceremony on June 11 after his great grand-daughter died in a car accident the night before. If he does come, it will be the perfect way to cap huge pride for a tournament which has rebranded not only this country but the whole of Africa. Fund managers say new business and capital is already flowing into the continent on the back of the tournament.